Adding a few exotic and uncommon fish like the Madagascar Rainbowfish, is a great way to make your tank stand out! The appeal of the Madagascar Rainbowfish Bedotia geayi is easy to see. The cool shimmer of the silver scales, smoldering red fins, and thick black markings make this bold fish unforgettable. It is also a larger rainbow fish, reaching about 6 inches (15 cm) in the aquarium. Keeping a school of healthy Madagascan Rainbow specimens will reward the aquarist with an active display of beautiful coloration and hours of entertainment. It is also known as Madagascan Rainbow Fish and Red-Tailed Silverside. The Madagascar Rainbowfish are great fish for the large tank fish keeper. They add visual interest and are able to adapt to a variety of conditions. Aquarists often find that the Madagascar Rainbowfish is more civilized than the other rainbow fish, making it suitable for pairing with a wider array of tank mates. They are a schooling fish and need to be kept in groups of at least 6 to be comfortable. But they are generally peaceful with each other and friendly with other species of similar size and temperament. These Rainbow fish do well with fish keepers that have a bit of aquarium experience, and they are a great fish to jump into breeding with. The Malagasy Rainbowfish are endemic to the island of Madagascar off the east coast of Africa. These rainbow fish are largely unstudied in their natural habitat, and there is much still to be discovered about this group of fish. Unfortunately the beautiful Madagascar Rainbowfish is under threat in the wild because of rapid deforestation and habitat modification. It is listed on the IUCN Red List of Threatened Species as vulnerable (VU). The Madagascar Rainbowfish Bedotia geayi was described by Pellegrin in 1907. They are endemic to the island of Madagascar off the east coast of Africa. These fish are only documented to inhabit the Mananjary River in Madagascar at altitudes of around 500 meters above sea-level. Other common names it is known by are Madagascan Rainbow Fish and Red-Tailed Silverside. The Malagasy Rainbowfish currently belong to the Bedotiidae family with two genera, Bedotia and Rheocles, with about 13 described species and a number of undescribed species. This family was placed in the suborder Melanotaenioidei in 2004 along with its sister families Melanotaeniidae, which contains the largest number of rainbowfishes, and Pseudomugilidae, a related family of Blue-eyes. However since 2006 they are being considered for placement as a subfamily of Melanotaeniidae. The Madagascar Rainbowfish live in the clear swift moving river of Madagascar. These fish normally congregate in groups of around 12 fish, usually in the shaded parts of the streams. Their natural diet is usually insects and plant matter. In nature these fish attach their eggs to the river's vegetation and do not guard them as some fish do. Juvenile Madagascar Rainbowfish normally stay along the shallow shores until they reach adult size and then proceed to deeper waters. As adults these fish inhabit freshwater rivers and are pelagic in nature, meaning they live in open waters. Because of rapid deforestation and habitat modification, the Red-Tailed Silverside is listed on the IUCN Red List of Threatened Species as vulnerable (VU). These fish have been pushed into higher altitudes caused by habitat degeneration and pressure from predators. 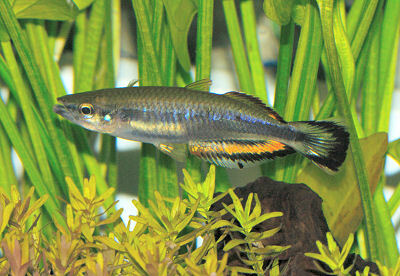 The Eastern Mosquitofish Gambusia holbrooki is an invasive species that has totally replaced this rainbowfish in lower elevations where deforestation has taken away their much needed shade. It is speculated that as deforestation goes into higher elevations, the invasive species will follow, and this could eventually eradicate the Madagascar Rainbowfish. Social Grouping: Groups - In the wild they congregate in groups of around 12 fish. IUCN Red List: VU - Vulnerable - Under threat in the wild because of rapid deforestation and habitat modification, it is listed as vulnerable (VU) on the IUCN Red List. The ecology of the Madagascar Rainbowfish is quite apparent. It is built as river fish and a powerful swimmer. Its body is long and slender with fins that are short but strong. The overall body color is a pale yellowish brown with a slight blue sheen. A heavy, dark blue band runs the length of the fish with a second fainter and shorter band just below it. The fins of males are black at the very base, fading through white into red, and finally ending with a black outline. The female's fins will be clear or sometimes a subdued version of the male's fins. There are many regional color variants. 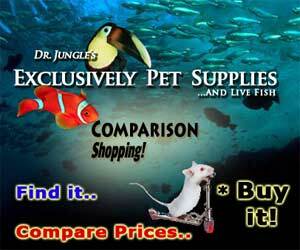 Lifespan: 5 years - Can have a life span of 5 up to 11 years when kept in a well maintained aquarium. The Madagascar Rainbowfish is one of the easier rainbow fish to care for and breed. As with all rainbowfish they need pristine water, but they are a bit more forgiving. They need frequent water changes, and this can aid in spawning. A fish keeper can experience breeding a fish that could soon be extinct. With a proper filter and oxygenated water, this fish will be a rewarding addition to your tank. Madagascar Rainbowfish are omnivores that feed on small insects and plant matter in their natural habitat. In captivity they are easy to feed, all they really need is a high quality flake or pellet food and occasionally live prey. Some good examples of suitable live food include bloodworms, tubifex worms, water fleas, or brine shrimp. These should be fed at least twice per week as a supplement to the prepared diet. If these are unavailable live, frozen (defrosted) substitutes would also be accepted. These fish should be fed twice a day and only what they can eat in less the 5 minute. Live foods (fishes, shrimps, worms): Some of Diet - Bloodworms, tubifex worms, water fleas, or brine shrimp should be fed a couple times a week. Vegetable Food: Some of Diet - Algae wafers make a good source of vegetable food. Madagascar Rainbowfish require a well maintained tank to be healthy. At least 25 - 50% of the tank water should be replaced weekly, especially if the tank is densely stocked. They are very active swimmers and also jumpers, so be sure the tank has a secure cover. Madagascar Rainbowfish are big, active, schooling fish. The aquarist will need to set up a suitable environment before purchasing this species. Start with a tank at least 30 inches long and no less than thirty gallons in capacity. Eventually adults will need a much larger tank, with 100 to 150 gallons being reasonable. These fish need a great deal of swimming area as well as densely planted areas to get into the shade for cover. The tank needs to have a good filtration system and be extremely well oxygenated. They are very sensitive to water changes and the water should be medium to hard and low in infusoria. Multiple powerheads should be used to give the natural affect of currents through the dense plants. When decorating the aquarium, use only tank safe rocks, bogwood, and aquatic plants. Leave a stretch of open water for swimming. A dark background and ideally dark substrate will bring out better colors and make the fish more secure. Try, if possible, to plan for one or two hours of sunlight hitting the tank. This should be time when you can view the tank as the illumination will make the fish even more stunning. Finally, top it off with a secure lid to prevent escape. Lighting Needs: Moderate - normal lighting - Shaded areas are need to help reduce stess and mimic their natural habitat. Water Region: Middle - Madagascar Rainbowfish mostly inhabit the upper or middle portions of the aquarium. Madagascar Rainbowfish are schooling fish and require at least six buddies to be at all comfortable. Life in the school should generally be peaceful, with occasional squabbles. The Madagascar Rainbowfish is usually friendly with other species, so it adapts well to life in the community tank. That being said, it should be noted that occasionally one will come across a fish with a more belligerent disposition, usually that is an older male. Care should be taken that in all instances other tank mates are similar in size, temperament, and activity level. Peaceful fish (): Safe - Good tank mates include large barbs and characins. Semi-Aggressive (): Monitor - Can include cichlids that are the more peaceful varieties. Slow Swimmers & Eaters (): Monitor - Rainbowfish are fast wild swimming fish that can make slower fish nervous. Male Madagascar Rainbowfish will have brighter colors than females, especially on the fins and tail. To breed the Madagascar Rainbowfish, a tank should be set up with moderately hard, alkaline water. The tank must be fairly large, at least 24 inches long, and should have a good current. Fine leaved plants and a sponge filter should be included. The pair will spawn continually over a few weeks. A few large brown eggs are laid each day, attached to the plants by threads. The eggs hatch after about a week. The parents usually ignore the fry and eggs, but breeders usually separate them anyway. The fry grow slowly and should be fed infusoria or liquid fry food until they can handle baby brine shrimp. Breeding is difficult and the young are very sensitive to their surroundings. See an overview of how to breed Rainbow fish in Breeding Freshwater Fish. The Madagascar Rainbowfish, also sold as the Madagascan Rainbow Fish or the Red-Tailed Silverside, is somewhat rare. Quality specimens usually cost a bit more than other rainbow fish species. We just got 3 Madagascan rainbows, (1 male and 2 females). The pet store said they'd grow to 3" and needed a 20 gallon. I have a tall 22 gallon and after reading up, I see that I should have an least 30 Gallo s as they'll be twice as long. They are quite lovely and busy. My rainbow had 40 eggs its been a week now when will they hatch? It generally takes 6-8 days for the Madagascar Rainbowfish eggs to hatch, depending on the temperature, so you should be seeing fry anytime now. Hello I have 4 Madagascar Rainbow fish and I know I have 2 males but I cant tell if my other 2 are females. How do I know if the other two are female? The standard answer is 'Males are far more colourful than females and have a pointed dorsal fin as opposed to the more rounded dorsal of the female.' Usually colors become more obvious as cichlids mature, and because you know you have two males, you should be able to visually compare them to the two unkowns and make a fairly good judgement. Of course, if they pair up and produce eggs, then you have a definite answer:) Good luck. I bought one about a year ago and he was the only one in the tank with about 20 danio's and he has grown quite a bit. He's about as big as they can get and he is in a 29 gallon, but I have a 10 gallon with mollies and they actually had fry and so I went to petsmart to buy them a mesh breeder. I looked to see if they got more madagascars in stock and they had about 10 for a limited time and so I got two females. My male didn't seem too happy with them at first but they are about a 1/3 his size are they too small to breed with him? Because I don't want to try it and they get hurt I just wanted him to have some friends and I do want to breed them because I have grown to love my male. I have been searching for more for so long I just don't wanna risk it if the two females will get hurt. I can definitely understand your wanting to keep them all safe. It sounds like you may want to keep the femailes separate, in the 10 gallon, to keep them safe until they get big enough to breed. If and when you do try to introduce them with the male, just be ready to separate them if they don't seem to adjust. Also, sometimes you can put a tank divider in to give them a chance to get familiar with, but out of reach of each other. I'm excited about your new fish!